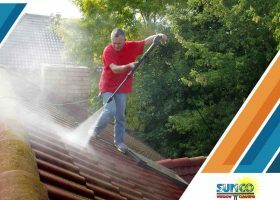 Roof Cleaning: Why Is It Important? Your roof is a standalone structure that will last for many years. Still, it is far from being maintenance-free, which is why it important that you observe proper upkeep for this exterior component. Apart from regular inspections, you must also clean it regularly to prevent further issues, such as moisture damage. Why Should You Clean Your Roof and Gutters During Spring? Copyright © 2019 Sunco Window Cleaning LLC. All rights reserved.